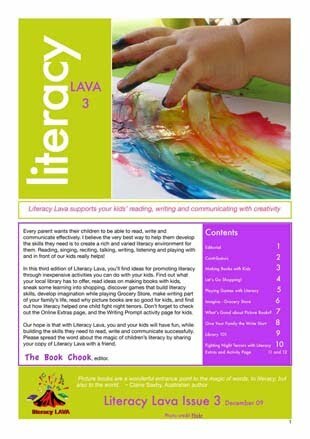 Literacy Lava 3 is now available on my website. Clicking here will take you to the page, where you simply download the pdf by clicking on its cover. It's another great issue, exploding with tips for parents about ways to encourage literacy in family life. Find out what your local library has to offer, read ideas on making books with kids, sneak some learning into shopping, discover games that build literacy skills, develop imagination while playing Grocery Store, make writing part of your family’s life, read why picture books are so good for kids, and find out how literacy helped one child fight night terrors. Don’t forget to check out the Online Extras page, and the Writing Prompt activity page for kids. Please help promote our love of reading, writing and communicating with creativity, by sharing this news with your networks on Twitter, Facebook etc.